Purchase the Full Tele Summit Set of 12 Sessions by clicking the image to the left, or click HERE. Ann Alden, MA, CEIP-ED, Director of Borderlands Center, started taking riding lessons when she was 8 years old and earned her first horse when she was 13. She owned and operated Esperanza Stables in Tucson, Arizona from 1977 -1986 and served as a Pony Club instructor during that time. Ann received a BA degree in psychology from Newcomb College, a BS degree in ecology and evolutionary biology and a Master’s degree in special education and rehabilitation counseling from the University of Arizona. She began volunteering at Therapeutic Riding of Tucson (TROT) in 1986 and completed their instructor training program in 1988. In 1992 she first became a NARHA certified instructor. She added the PATH International Equine Specialist in Mental Health and Learning certification when it first became available and is a Certified Equine Interaction Professional as an Educator. 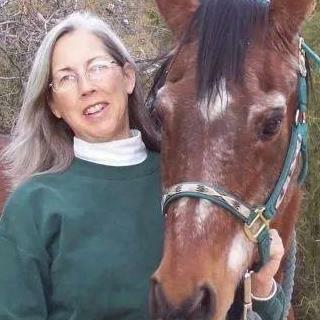 She has been providing equine assisted activities since 1986. Ann was hired by Barbara Rector to work for the EFP program at Sierra Tucson, and in 1992 founded The Riding and Rehabilitation Center, a PATH Accredited Center in Tucson. From 2001 – 2006 Ann provided equine assisted services at L Lazy E Ranch. She is past president of EFMHA (Equine Facilitated Mental Health Association), a faculty member for the PATH International Equine Specialist certification workshop, and a faculty member for the Adventures in Awareness internship. From January, 2009 to May, 2012 she served as program director and head instructor at CANTER, a PATH International premier accredited center in Sierra Vista, AZ. Ann has served on the PATH Certification Oversight Committee for the last 3 years and recently joined the board of directors of the Horses and Humans Research Foundation.